Take On Sports offers athletic opportunities for Special Needs Youth and Adults with physical and/or intellectual challenges. Please accept this donation in honor of John Fisher, Take On Sports Baseball Commissioner, (and all the kind folks at Take On Sports & WC-WAA) for all you do on behalf of families like ours. Playing baseball is a dream come true for our son, Drew, and we are incredibly grateful to all of you! Keep up the good work. I want to take this opportunity to tell you all what a wonderful job you do! My son, Garrett Rosen, was a buddy for the first time during your recent Challenger Basketball program. For 6 weeks, he gained so much from helping the players and looked so forward to going every time! I stayed during the hour sessions as well because it just warmed my heart to see the children's smiles and determination. I loved watching my son and the other buddies as they learned what patience and giving back to others is all about. The awards ceremony/game was amazing, and it was obvious that the participants had so much fun and felt extra special with all of the attention. Well deserved! Garrett realizes that just by making one basket meant the world to the challengers! Thank you so much for this wonderful opportunity. Have a happy holiday season! We loved participating in baseball this past Spring. It made life feel more "normal" for a while, taking our son to play baseball as opposed to taking him to speech therapy or some other therapy appointment. We truly looked forward to it every week, and by season's end, Charlie could hit the ball off of the tee by himself. We've moved to Charlottesville, VA for a better school for Charlie. I can say with all honesty, what I will miss the most about Charlotte is THIS sports league. There is nothing similar here. In fact, I just told my husband I would love to start something similar here as I hate for Charlie to miss out on the opportunity to play sports. Thank you to our official sponsor TSS Photography! 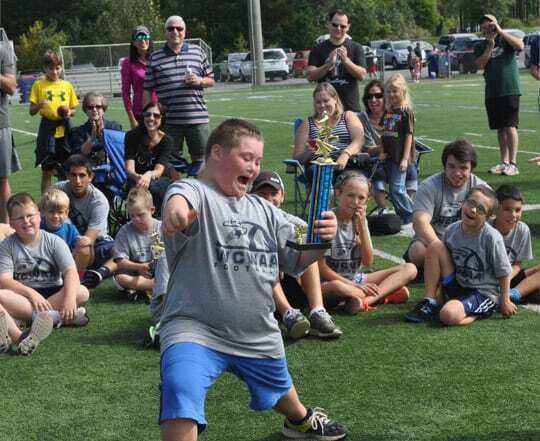 Take On Sports is a program offered through Wesley Chapel-Weddington Athletic Association, (WCWAA), a 501(c)3 non-profit tax-exempt organization, in Union County, North Carolina. We serve the surrounding areas in and around Union and Mecklenburg Counties in North Carolina. Donations are tax deductible to the extent of the law. © 2018, Take On Sports. All Rights Reserved.